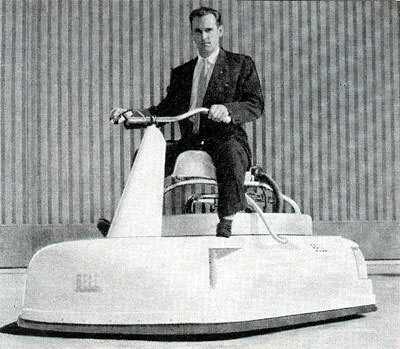 When I was in 5th grade, I saw an ad in the back of Boy’s Life magazine for a set of plans that promised show you how to build a personal hovercraft using simple hand tools and old vacuum cleaner motor. Needless to say, I knew that this was going to be the best $2 I had ever spent. I was going to be pulling up at school, stepping out of my own personal Jetson’s-mobile, while the other kids were busy chaining up their Bicentennial Sears Free-Spirits, and hand-me-down Sting-Rays. I guess I knew that there was going to be an electrical cord issue with the vacuum cleaner motor, but that I could probably figure something out with a lawnmower engine or something. The plans turned out to be a little disapointing. I would have settled for any of the fine vehicles pictured in this June, 1960 Popular Mechanics spread. This entry was posted on Monday, February 12th, 2007 at 9:34 pm	and is filed under Miscellany. You can follow any responses to this entry through the RSS 2.0 feed. Both comments and pings are currently closed. Anyone have more info on number 2? Yup. Number 2 is the 1959 Curtiss-Wright model 2500 “Bee”, (AKA “Air-Car”) prototype. 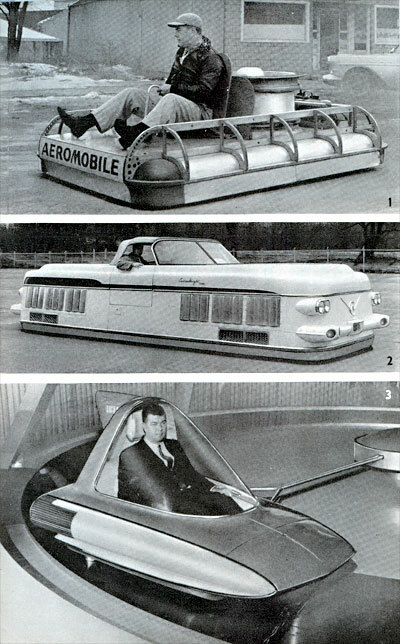 Experimental 2p passenger air-cushion hover-car, built in test form (lower photo), anticipated market in ag application and as swamp buggy; 85hp Continental with 6′ two-blade prop (projected multi-blade props with two 180hp Lycomings) width: 8’0″ length: 28’0″. Michael Cutler et al. Total “flight” time in mid-July 1959 was about 25 hours, albeit only inches AGL; top speed: 35. Displayed at Fort Eustis Transportation Museum, Colonial Williamsburg VA.
#3 is the hovercraft pimpmobile! The first one looks like something from the ACME catalog. 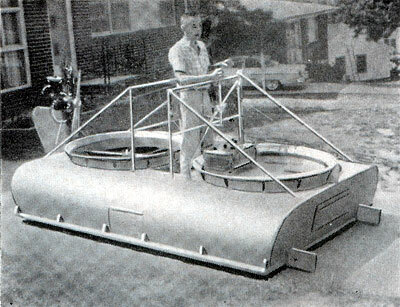 We built one similar to that of the Gadget Show – ours was a circular board with a leaf blower mounted toward the front. It gave the rider something to hold on to. Mind you, the rider was typically a youth weighing not more than about 50lbs (22.7 kilo). The supervising adult would swing the craft around using the electrical extension cord making it a wild – but fun – ride! We were there. 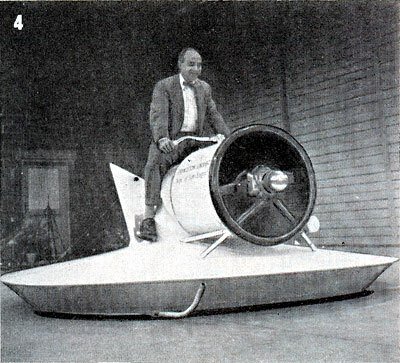 Building hovercrafts in the late 50′s and the 60′s. 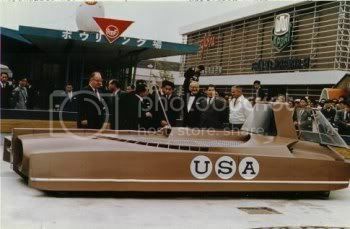 We had a three passenger flying hovercraft that was featured in the garage of the house of the future at the 1961 Seattle worlds fair. 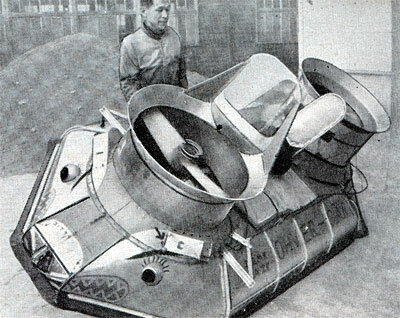 It was on the cover of Science & Mechanics – Sept – 1961. What really made me feel old was finding a mint condition example of the magazine at an antigue fair. When I was in the scouts I ordered those plans too. I opted for the one large disk plan instead of the three small disks plumbed with PVC – even at that age I could tell that the plumbing would be a source of leaks and not distribute the air evenly. My 4 foot plywood disk flew under the power of the motor from our discarded Electrolux vacuum cleaner. I think the skirting was the hardest part. Nice blog. I made a simple hovercraft for my 4 year old son this weekend with plywood a leaf blower and shower curtain. He learned about air pressure. Cool stuff! We found a fun site with neat science experiments like simple hovercraft directions. I will put the link below for anyone interested.